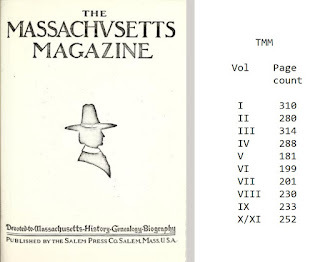 While researching for the next issue (IV) of the TGA in which we will look at Volumes VI through XI of The Massachusetts Magazine, we were reminded that the last issue of this periodical was 100 years ago, this month (January 1918). This effort by Dr. Frank and friends ran for ten years. We looked at Volumes I through V in the last TGA issue (Vol III). These two will be printed under one cover in the spring of this year. So, how to look back at the effort and bring the TMM forward? As I read the articles, I have two things in mind. This was an American effort, as in the participants were, for the most part, of families who were involved with the development of the country, from the beginning. An example is Col. Higginson, His family is pre-Winthrop's arrival in 1630. Too, Gardner and Higginson go way back. Dr. Frank's publisher was Higginson. 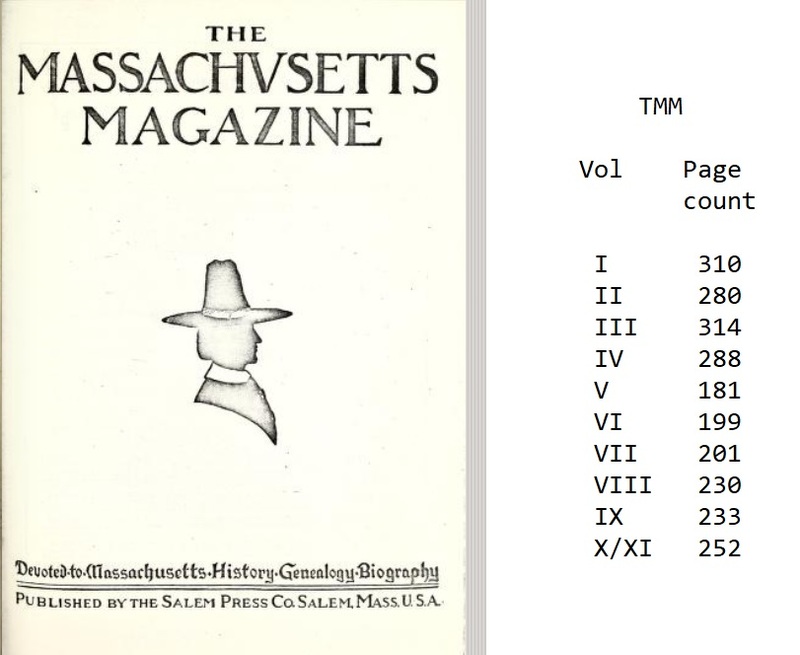 The image shows the page count by volumes for the TMM. Volume I was published in 1908. For the most part, the issues were quarterly. In each issue, Dr. Frank presented material related to a regiment that was at the Siege of Boston. Lucie, his sister, carried on Sidney Perley's work for several issues. Judge Thompson presented several articles on his western adventure as a youth, not long after the trek of Lewis and Clark. As one looks at the TOC of each issue (see this post for a listing - TMM, Vol. I and II which starts a series that provides links to archive.org's digitized issues), one sees that things get sparse about five years in. After our initial introductory look at each issue, which is about done (TGA Vols III and IV), we will start to do a deeper dive into the material. A lot of the topics are still apropos. And, looking at the TMM got me to look at other periodicals, such as The Atlantic (still publishing, albeit they moved from Boston to DC). Also, other topics, such as the Lyceum, came to the attention. 01/20/2018 -- As we go through the remaining volumes (VI through XI), we are accumulating more material for additional research and publication. In 1917, the culmination of the discussion about Europe was the U.S. conscription and the initiation of U.S. troop involvement in Europe. In the October issue of the TMM, in 1914, there was a report on the attitude about Europe. New England favored the Allies. 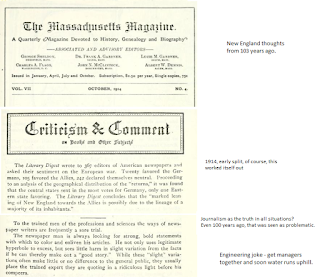 The majority of the respondents to the survey of the Literary Digest were neutral. 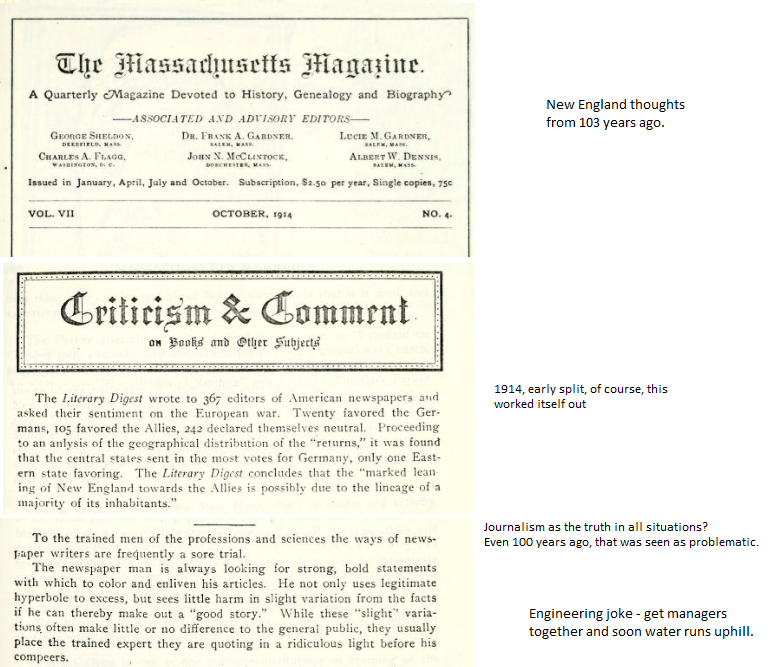 The survey was of editors of newspapers in the U.S. Prior to that year, there had been many articles provided by older gents, such as Col. Higginson, F.B. Sanborn and F.M. Thompson who were veterans of the U.S. Civil war. Judge Thompson wrote a series on his western jaunt. Now that we have gone through the entire Table of Contents (all issues) with a quick read, we can get into the depth of the articles and study how they pertain to our interest in research. We intend to publish the digitized pages in future TGA issues. 02/11/2018 -- The Spanish flu would have been a contributing factor to the demise of The Massachusetts Magazine. The flu was first observed in Kansas in March of 1918, however it was in Massachusetts by summer. 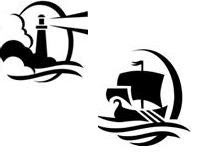 02/16/2018 -- Our first post on The Massachusetts Magazine was May 28, 2014. Since then, we have published a copy of the Table of Contents for each issue and have reviewed all of the issues. The first five volumes were summarized in The Gardner Annals (Vol. III), We will have a similar look at the last six volumes in the next issue of The Gardner Annals. TGA Vol III and Vol IV are expected to print in the spring of 2018. 06/04/2018 -- The absence of the magazine was felt.